Blood pressure is not one pressure but two: the first, termed systolic, represents the arterial pressure during the heart’s active contraction phase when blood is being pumped from the heart to the tissues; the second, termed diastolic, represents the arterial pressure during the heart’s relaxation phase when the heart’s chambers are filling with blood returning from those same tissues. Unlike veins that appear blue beneath the skin and are readily compressible, arteries are pulsatile, muscular, and easily palpated in the neck (carotid) and wrist (radial). The number of times the heart contracts during a minute is the heart rate. Arteries are under high pressure, and the flow of blood through them is active and dynamic. To sustain these pressures, arterial walls need be both strong and elastic. The innermost layer, the tunica intima, directly interfaces with blood and consists of an elastic membrane surrounding squamous epithelial cells. The middle layer, the tunica media, is comprised of smooth muscle and is capable of contracting and expanding to maintain a constant flow of blood. The outer layer, the tunica externa, is composed primarily of collagenous connective tissue that helps to support and anchor the vessel. During an average person’s lifetime, the heart will beat more than 3.2 billion times! Clearly, this is an amazing feat, but just as amazing is the ability of the artery to withstand the forces of those billions of contractions. The arterial wall force = blood pressure x surface area. Thus, the greater the blood pressure, the greater the force and the greater the stress. The effects of hypertension are cumulative over a lifetime. While the short-term risk is low, the long-term risk is high, increasing in proportion to the blood pressure elevation. The physiologic response to hypertension is a gradual remodeling of the arterial wall, resulting in plaque and calcium deposits that ultimately narrow and harden the vessel—neither of which is conducive to the smooth, laminar flow of blood. When a plaque ruptures, a clot forms around the site of injury, often completely occluding the lumen of the vessel. If this occurs in one of the coronary arteries of the heart, the result is a heart attack. Furthermore, if a small plaque breaks off from a vessel and lodges downstream in the brain, the result is a stroke. Upward of 90% of strokes are caused by small clots and embolic plaques, with the remainder caused by blood vessels bleeding directly into the brain. The risk of both types of stroke increase with hypertension. Prolonged blood pressure elevation not only leads to plaque and calcium deposits, but also can result in a thinning of the muscular medial layer of the vessel, predisposing it to aneurysm formation. A dilated, distended artery is weaker and more prone to burst. Aneurysmal rupture—be it in the brain, abdomen, heart, or elsewhere—is an acute catastrophic emergency that is often fatal. Lastly, in response to the sheering stress of blood flowing under pressure, a small tear sometimes occurs along the intimal lining of an artery, allowing blood to dissect between the layers of the vessel triggering severe pain and occasionally a heart attack or stroke. Hypertension accounts for more cardiovascular deaths than any other modifiable risk factor, and is second only to smoking as a preventable cause of death for any reason. When the blood pressure is above normal, each rise of 20/10 mm Hg doubles the lifetime risk of cardiovascular death, so that someone walking around with a blood pressure of 160/100 has a 4-fold increased risk of cardiovascular death relative to someone with a blood pressure of 120/80. The correct question, however, is not whether hypertension results in premature death, but rather does treating hypertension reduce cardiovascular mortality? Blood pressure is, after all, merely a surrogate marker for the things that really matter: stroke, heart attack, heart failure, kidney failure, and cardiovascular death. And it’s here where the definition of hypertension (i.e. high blood pressure) becomes inexact. Is hypertension any blood pressure above the mean? Or is it the pressure above which premature death is more likely to occur? What if the blood pressure leading to premature death is a moving target? Do young and old people really require the same blood pressure for maximal health? At the extremes it’s easy—blood pressures of 200/110 mm Hg are clearly associated with premature cardiovascular death and treating this degree of blood pressure elevation prolongs life. But the law of diminishing returns applies—those with extreme elevations derive significant benefit, while those with minimal elevations derive hardly any benefit at all. Meanwhile, the level at which further reduction results in net harm has yet to be established. It’s not even clear that the blood pressure obtained using an external cuff is an accurate reflection of the true pressure within an artery, particularly when that artery is heavily calcified. I frequently review x-rays in octogenarians where the vessels are encased by a rigid coat of calcium. In such cases, I wouldn’t expect the blood pressure to be the same as in a non-calcified vessel. After all, it’s harder to squeeze a lead pipe than a garden hose. It’s also not clear that heavily calcified arteries are the ones most likely to develop life-threatening complications. For instance, consider the heart, where it’s not the heavily calcified vessels that are the most dangerous, but rather those vessels that are partially occluded with fresh, unstable plaque that are most predisposed to causing a heart attack. I find it problematic to think that an elderly matron with a reading of 180/110 mm Hg requires the same reduction in blood pressure as a 30-year old man with a similar reading who smokes cigarettes and abuses crack cocaine, but the new hypertension guideline recommends the same target blood pressure of less than 130/80 mm Hg for both. X-ray of the ankle demonstrating calcified posterior tibial and dorsalis pedis arteries. Until recently there was a paucity of data demonstrating that lowering blood pressure in hypertensive patients to 120/80 was any better than lowering it to 140/90 to prevent complications like heart attack and stroke. That changed in 2015 with the publication of SPRINT (Systolic Blood Pressure Intervention Trial) in the New England Journal of Medicine. In this trial, more than 9,300 patients were randomized to a target blood pressure of 120/80 versus 140/90. The patients were then followed over time, comparing the rate of heart attack, acute coronary syndrome, stroke, heart failure, and cardiovascular death. The trial was stopped early after a little more than 3 years (a statistical no-no), when the authors found fewer bad outcomes in the lower blood pressure group. The number of patients who developed one of the bad primary outcomes was 2.19% per year in the higher target group versus 1.65% per year in the lower target group. Pharmaceutical companies, eager to push their products on patients, reported this in relative numbers as a 25% reduction in adverse events, whereas the absolute difference was a mere 0.54% per year. If this latter number sounds like a trivial difference, that’s because it is. Applied more broadly, it means that a physician would need to lower the blood pressure from 140/90 to 120/80 in an additional 185 patients in order to prevent 1 bad outcome per year. Nor is it easy to achieve that additional decline in blood pressure. All study patients underwent 3-month check-ups for the duration of the trial, received lifestyle counseling, and frequent medication dosage adjustments in order to reach their target blood pressures. Both patients and physicians were motivated and knew that they were participating in a study—things that are known to markedly improve treatment compliance. The average patient ended up taking 2.8 blood pressure-lowering medications in the lower target group (one more than in the higher target group). In the real world, we know that once a patient requires 4 or more doses of medication per day, the compliance rate falls to about 50%. Outside of a study protocol, how many people are actually going to exercise, modify their diet, take 3 blood pressure medicines, and see their doctor every 3 months for a blood pressure check? In November 2017, the ACC/AHA (American College of Cardiology/American Heart Association) released their latest guideline regarding the detection and management of hypertension. It’s a massive piece of work, comprising 481 pages, 23 tables, 11 figures, and thousands of references. The original guideline on hypertension released by the National Heart, Lung, and Blood Institute in 1977 contained just 6 recommendations; the current one contains 106. Most have solid evidence backing them. Slogging through the guideline, I was happy to see an emphasis on lifestyle modification—not medication—as the first line treatment. 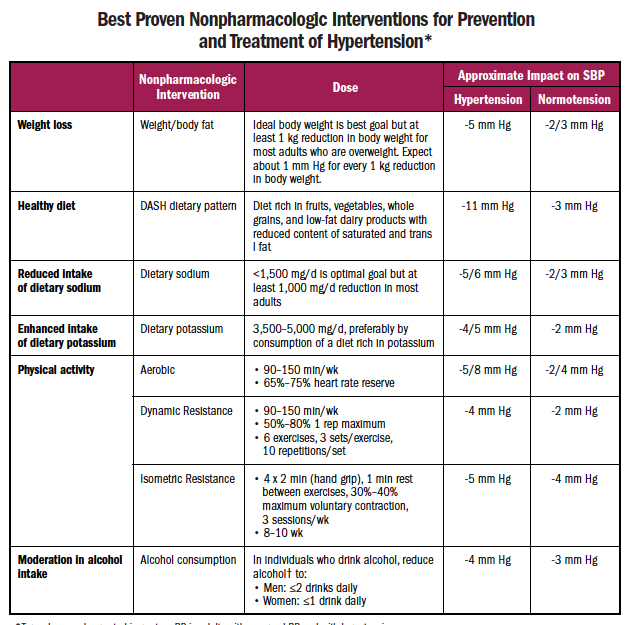 Interventions include: exercise (90-150 minutes/week), weight loss, heart-healthy DASH diet (Dietary Approach to Stop Hypertension), sodium restriction (less than 1,500 mg/day), increased potassium intake, and moderate alcohol consumption. 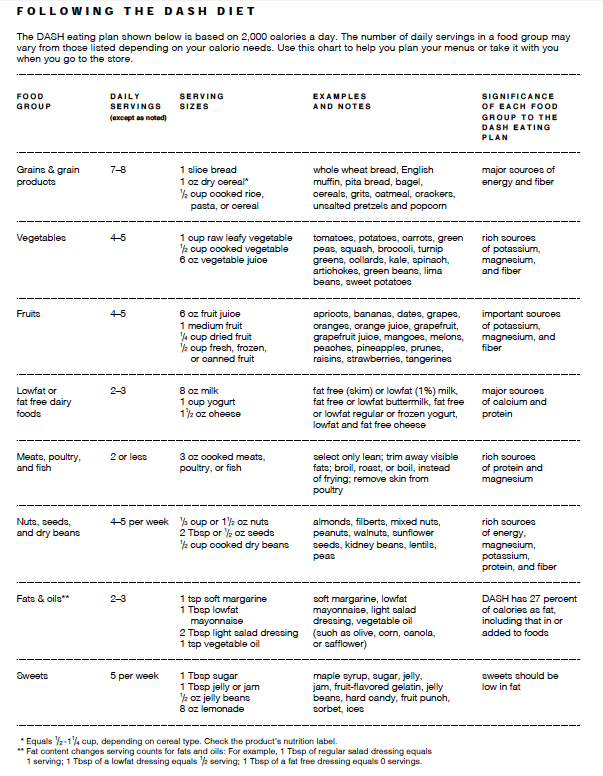 The guideline also stresses the importance of obtaining an accurate blood pressure reading before initiating treatment. Prior to a blood pressure check, the patient should refrain from caffeinated beverages, smoking, or exercise for 30 minutes, and be at rest for at least 5 minutes beforehand; be seated with back straight and uncrossed feet placed flat on the floor; the cuff placed around an unclothed upper arm at the level of the heart. At least 2 readings, taken at least a minute apart, should be performed on at least 2 occasions before diagnosing hypertension, and the process repeated during follow up to gauge the effects of lifestyle modification before starting medicines. Many people become acutely anxious at the prospect of having their blood pressure checked (“white coat syndrome”). This is a significant problem, affecting between 13-35% of people diagnosed with hypertension, leading to persistently elevated readings in the doctor’s office that are not an accurate reflection of the patient’s true blood pressure. Occasionally, the opposite occurs wherein the patient, in the safety and security of his/her doctor’s office, has a normal blood pressure that is otherwise poorly controlled at home (“masked uncontrolled hypertension”). In either case, home blood pressure monitoring may be performed by the patient or family using any one of a number of accurate, commercially-available blood pressure kits. Alternatively, physicians may recommend an ambulatory blood pressure monitor. These devices are worn at home and programmed to take measurements throughout the day (usually every 15 to 30 minutes during daylight hours, and every 15 to 60 minutes at night). Once an accurate average is obtained, patients and physicians can discuss treatment options. So far, so good; the guideline provides sound advice. Using this definition, roughly a third of US adults were hypertensive, the prevalence of which increases with increasing age. After age 45, the lifetime risk of developing hypertension ranges from 86% in whites, to 92% in Hispanics, and 93% in blacks. 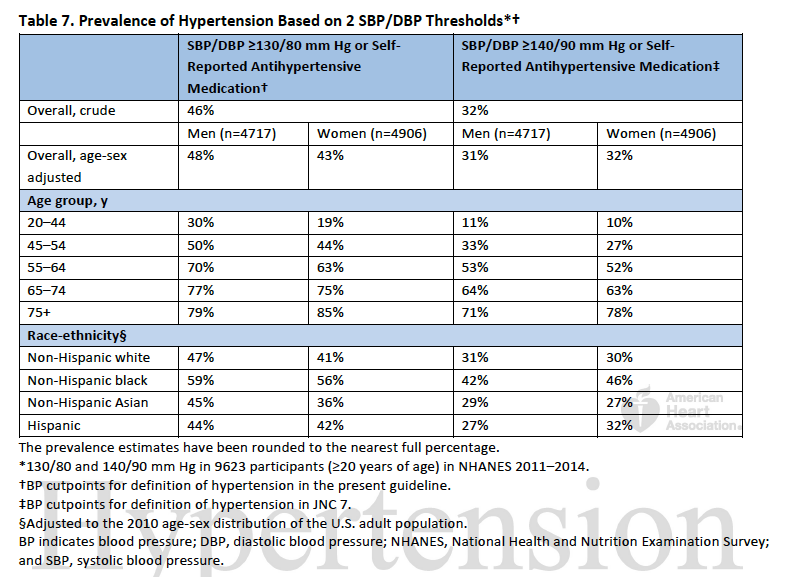 That’s a lot of hypertension, but under the new criteria those percentages will be higher still. What this boils down to is a redefinition of what defines hypertension, from a blood pressure of 140/90 to 130/80. Doesn’t necessarily sound like much, but with the stroke of pen, 31 million more Americans now suffer a chronic disease, raising the prevalence of hypertension to nearly half of all adults (46%). This is similar to what happened in 2003 when the definition for diabetes changed, causing an additional 25 million Americans to be diagnosed with the disease, and, again in 2013, when the criteria for statin use changed, recommending their use in an additional 45 million adults. Unfortunately, labeling all those additional people as sufferers of chronic diseases and recommending treatment hasn’t led to a change in all-cause mortality—Americans born today can actually expect to live shorter lives than their parents. In support of the guideline, a recent analysis in JAMA Cardiology calculated that the lower cutoff has the potential to prevent 610,000 adverse cardiovascular events and 334,000 deaths in US adults over the age of 40, “assuming the entire US adult population (italics added) achieved guideline-recommended systolic blood pressure treatment goals.” Sure, and when pigs fly we’ll have no motor vehicle deaths, no gas shortages, and no global warming, as everyone will simply fly their pig to work instead of driving cars. This is not to disparage or demean the authors’ intentions, but “talking the talk” is one thing, “walking the walk” is quite another. Lower might be better, but getting there will be near impossible. Under the old definition, fewer than 50% of hypertensive Americans had their blood pressure under good control, with roughly a third of them completely unaware of having hypertension at all, numbers that are sure to rise using the lower cutoff of 130/80. Until we address far more fundamental issues like education, housing, and access to care, it’s a pipe dream to believe that hypertension will be controlled in this country. But that doesn’t mean that we shouldn’t try, and the new guideline represents an improvement over many others that I have read. None of its authors had financial ties to industry—a big problem with the earlier statin guideline—but this doesn’t mean their recommendations are free from bias. The authors have academic appointments to institutions ranging from Johns Hopkins to the Mayo Clinic, and have vested academic interests in research and publishing that affect the manner in which the data they analyzed was selected and interpreted. Noticeably absent from the committee were any rank-and-file family practitioners or emergency physicians, the two groups who see more outpatient hypertension than all other specialties combined. In my population of ER patients, it’s frankly absurd to believe that there are enough community resources available to address the huge number of untreated hypertensive patients that daily stroll through my doors. In the SPRINT study, where both the patients and physicians were highly motivated, the average blood pressure still didn’t achieve the target goal of 120 systolic. How, then, are we supposed to achieve it in a patient population with far less motivation, limited access to care, and few financial resources? But even if it were possible to treat each and every American with high blood pressure, I would remain skeptical of our ability to control it, because there’s a good bit of evidence to suggest that the medications used to treat hypertension simply don’t work very well. In fact, there’s not a single medication capable of lowering blood pressure by even 10 mm Hg! There, I said it. That’s the dirty secret the pharmaceutical companies won’t tell you. Across the board, from beta-blockers to diuretics, to calcium-channel blockers, to vasodilators, to angiotensin-converting enzyme inhibitors, none of them work individually to reduce blood pressure by more than 5 to 6 mm Hg systolic and 3 to 4 mm Hg diastolic. And this explains why so many people require so many medicines to get their numbers down. If you visit your doctor with a blood pressure of 170/95 and she tells you that a single pill of hydrochlorothiazide is going to bring it down to normal, well … just forget about it. The HOPE-3 Trial published in 2016 looked at more than 12,700 patients treated with 2 blood pressure-lowering medicines versus a placebo over 5.6 years of follow up. Not only didn’t the drugs work well, they had almost no effect on the number of patients suffering heart attacks, strokes, or cardiovascular death. Overall, 1,000 patients required treatment to prevent one adverse event per year. Conversely, this means that 999 of 1,000 treated patients received no benefit, while an extra 14 patients were harmed, primarily in the form of dizziness and low blood pressure. Lastly, consider the cost: the August 2018, generic price for the study drug (candesartan-hydrochlorothiazide 16-12.5 mg) runs a cool $105.60/month, and more for the brand name drug. Not much bang for the buck. Let’s assume that you’re a 50-year old man with hypertension who smokes and is 30 pounds overweight. Your father had a heart attack at age 56 but is still alive after a bypass and a couple of cardiac stents. You see your doctor for the first time in a long time and are surprised to find that your blood pressure is elevated to 181/95. Your doctor is up on the new guideline and spends a good bit of time talking to you about lifestyle modification before starting you on a diuretic to help lower your blood pressure. After a chest pain scare sends you to the ER, you get serious and quit smoking. You start walking 2 miles around a track after work, go on a diet, even start reading the fine print on food labels to cut back on your sodium. That, and the blood pressure pill, makes a difference. Your weight is down 15 pounds and you feel great, but your blood pressure remains elevated to 136/88. Your doctor congratulates you and gives you a hearty clap on the shoulder before saying that he wants to add a second pill to your regimen to get your pressure below 130/80. You reluctantly agree, but over the next 3 months as the weather turns cold and wet, you give up the evening walks and regain 10 of the 15 pounds you’d lost. You’re hoping that the second pill will make up for not exercising, but when you return for a 6-month check-up, your blood pressure is higher than before. It’s now 150/92. Your doctor wants to add a third medicine. Should you take it? 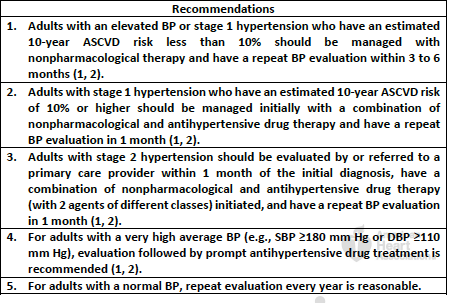 Hypertension treatment recommendations (J Am Coll Cardiol 2018; 71: e127.) To calculate your 10-year risk of developing ASCVD (Atherosclerotic Coronary Vascular Disease), see: http://tools.acc.org/ASCVD-Risk-Estimator-Plus/#!/calculate/estimate/. What if the doctor then tells you that for every 10 mm Hg drop in blood pressure your risk of heart attack decreases by 20%, and your risk of stroke declines by 27%? On-the-other-hand, what if he tells you that to prevent a heart attack by lowering your blood pressure an additional 10 mm Hg requires treating 74 patients, and that preventing a stroke requires treating 127 patients? The vast majority receive no benefit from the reduction and some will be harmed by it. In both scenarios, the doctor is being truthful as these seemingly disparate statements are actually just different ways of summarizing the same information. The first statement, that expresses the benefit of lowering blood pressure in relative terms, sounds far more impressive. But relative numbers can be deceiving when the prevalence of the disease in question is uncommon. For heart attacks and strokes, that occur at a rate of less than 2% per year in patients with mild blood pressure elevation, the majority of patients taking antihypertensive drugs derive no benefit from them. How physicians present this data is termed “framing,” and how doctors frame the information they present to patients, in turn, depends upon their own implicit biases. Based on my biases, it makes far more sense to focus our limited resources to diagnose and treat the millions of patients with markedly elevated blood pressures who currently lack health insurance than it does to focus attention on 80-year old Aunt Betty’s blood pressure of 138/88. Pharmaceutical companies never express a drug’s benefit in terms of the “number needed to treat,” because they know that, for most people and most conditions, the drugs they’re selling aren’t very effective. They much prefer framing a drug’s benefit in relative numbers—how well it works relative to some other (usually inferior) treatment or no treatment at all. It takes real effort to lower blood pressure, particularly if there is a strong family history of it. More than 90% of the time, elevated blood pressure is the result of essential hypertension, meaning that the blood pressure elevation is essential to your unique body chemistry. There are both hereditary and environmental factors that result in high blood pressure, and while you can’t modify your genes, you can certainly modify your environment. The keys to controlling blood pressure are the same ones used to prevent diabetes, cancer, depression, and a host of other medical maladies: eat well, exercise a lot, don’t smoke, maintain a healthy weight, and periodically check your blood pressure, blood sugar and cholesterol. Trust first in yourself, then in your doctor, and lastly—only after lifestyle interventions have failed—should you trust in pharmaceuticals. Until next time, stay healthy, my friends. Paul Whelton et al., “2017 ACC/AHA/AAPA/ABC/ACPM/AGS/APhA/ASH/ASPC/NMA/PCNA Guideline for the Prevention, Detection, Evaluation, and Management of High Blood Pressure in Adults: A Report of the American College of Cardiology/American Heart Association Task Force on Clinical Practice Guidelines,” J Am College Card 2018; 71: e127-e248. Robert Carey et al., “Prevention, Detection, Evaluation, and Management of High Blood Pressure in Adults: Synopsis of the 2017 American College of Cardiology/American Heart Association Hypertension Guideline,” Ann Int Med 2018; 108: 351-58. The Sprint Research Group, “A Randomized Trial of Intensive versus Standard Blood-Pressure Control,” NEJM 2015; 373(22): 2103-16. Sandra Taler, “Initial Treatment of Hypertension,” NEJM 2018; 378 (7): 636-44. Jessica Weiss et al., “Beneﬁts and Harms of Intensive Blood Pressure Treatment in Adults Aged 60 Years or Older: A Systematic Review and Meta-Analysis,” Ann Int Med 2017; 166: 419-29. Sripal Bangalore et al., “Optimal Systolic Blood Pressure Target After SPRINT: Insights from a Network Meta-Analysis of Randomized Trials,” Am J Med 2017; 130 (6): 707-719. Joshua Bundy et al., “Estimating the Association of the 2017 and 2014 Hypertension Guidelines With Cardiovascular Events and Deaths in US Adults: An Analysis of National Data,” JAMA Cardiol 2018; 3(7): 572-81. Eva Lonn et al., “Blood-Pressure Lowering in Intermediate-Risk Persons without Cardiovascular Disease,” NEJM 2016; 374 (21): 2009-20. This entry was posted in Uncategorized and tagged elevated blood pressure, hypertension. Bookmark the permalink. ← I’m skeptical about … fat.